From the the first page, I was hooked. I fell in love with the first poem. Then the prologue. So gorgeous. From the first word, I wanted to read this story aloud. It is beautiful. It is intricate and simple at the same time. Whew! And that was just the opening pages. Then I started chapter one. And I continued reading aloud. To myself. I don’t read a lot of middle grade. When I do, I often find it cheesy or too simplistic. This book is not like that. This book begs to be read aloud to a group of tweens. It flows. It’s written wonderfully with a lovely rhythm and just the right balance of sentimental and adventure and description. Nell is a realistic character, who, like many twelve-year-olds, is in the awkward stage of being a kid but also wanting to be treated more grown up. She is real and fun and smart and scared and kind and also a little selfish sometimes. She doesn’t have a lot of friends. Life isn’t great for her. But she’s trying. This story feels perfect for older elementary school kids. I started to recognize some MG tropes in this book. This isn’t a bad thing. I think it’s mainly because I’ve started reading just a little more MG and I recently attended a workshop on writing for kids. Unlike most YA, in which the main character wants to get away from their life or their parents, in MG, the main character, like Nell, wants to fix where they are. They want to be home, with their parents and family. And in this case, rescue mom. This story feels perfect for older elementary school kids, for a class or a book club to read and talk about and create for. I can imagine discussions about birds and nature and dreams and science and morality. I can imagine creative projects like drawing or imagining what this world might look like. 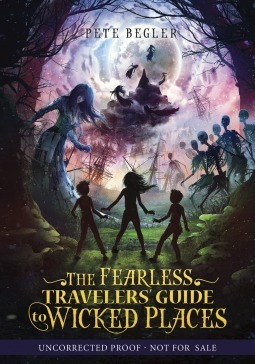 For Nell and her brothers, this means travelling into the Wicked Places, inside of dreams and exploring and battling through the rules of a strange world full of tricks and magic. But, they have a guide or two to help them along. This is the only reason this book lost half a star–at times, the guides seemed a little too helpful or help seemed a little to coincidental, even for middle grade. But, I seriously enjoyed this story. There are definite lessons in this book. But they are presented in a way that makes sense and works with the situations the characters are in. They are life lessons, yes, but they are integrated into the novel in such a way that they feel particularly perfect for the adventures of the characters. Lessons on bravery and friendship, family and perseverance. I was constantly surprised by new developments, new tricks, new intricacies of this world that Begler has created. It was on the edge of my seat. I couldn’t put this book down. One of my bubble baths lasted until the water was frigid because putting this book down even for the few moments to get out of the tub and crawl into bed was too much time away from Nell and her adventure. Do you think you’d enjoy this book?